We firmly believe that our police department is not just a group of people who work within the City of Springdale, but that our police department is part of the City of Springdale. We actively seek out ways to relate to our citizens, businesses, and visitors. Whether it is through our monthly neighborhood watch meetings, seniors meetings, community charitable activities, the citizens police academy, safety town, DARE, or other events we know we need to be part of the community and to be engaged with the community. Springdale is a great place to live or work. We understand as law enforcement professionals the vital role we play in helping keep our community safe and nice. Our dedicated employees are here twenty-four hours a day, seven days a week, to make sure that happens. Please feel free to call or stop in if you have any concerns or questions. We are here for you. An adherence to moral and ethical principles; honesty. Quality service, efficient service, and courteous service. Mutual respect, trust, and teamwork. Personal and departmental responsibility, hard work, and discipline. 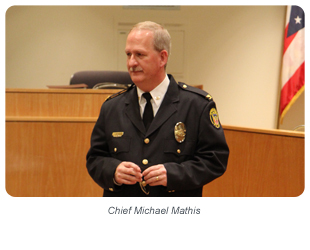 Chief Michael Mathis was appointed to his position in January of 2011. Chief Mathis has been a member of the Springdale Police Department since 1986. He has served as a uniformed patrol officer, detective, patrol sergeant, patrol lieutenant, and investigative lieutenant before his promotion to Chief. He has a bachelor's degree in police administration from Eastern Kentucky University and a master's degree from the University of Cincinnati in criminal justice. He also has attended advanced training through the Police Executive Leadership College and the Certified Law Enforcement Executive training offered through the Ohio Association of Chiefs of Police.